As I moved up in timeline towards the late 1900’s I learned that kit house companies were no longer profitable and were beginning to close their doors. These companies provided house kits to customers that consisted of all the standardized materials cut, tooled, and ready to be put together by a carpenter and/or the owner. By the mid 1900’s construction technology and the automobile industry continued to innovate new building materials and larger vehicles for ground transportation. At some point, the automobile and construction industries came together to develop what we know today as the Recreational Vehicle (RV) on a large scale. Remember, the first RV was around in the early 1900’s, which means it wasn’t a new technology. However, these initial RV’s were large vehicles where the living/sleeping area was a cloth covered back. By the 1950’s recreational vehicles started including beds, seats, and other amenities that made it a comfortable camper. By the late 1900’s, RV’s were at a point where they were being mass produced with all of the necessary amenities to have a comfortable road trip. People began flocking towards this lifestyle of travel and exploration. Just like the automobile industry, the construction industry also shifted towards prefabricated houses where materials were fabricated and assembled in a warehouse and shipped to the final house’s location. Although the kit house companies could’ve shifted to this prefabricated method, a majority of them had to file for bankruptcy because of their business model. Most of these businesses allowed home owners to purchase a kit house with a large down payment and as the components were being packed to ship, some of the owners would decide not to go through with the order. Combine this with other financial issues like providing these houses on credit to the owners who would have issues paying the money, the kit house businesses had no choice but to shut their doors. As this was happening, smaller businesses entered the prefabricated house area and to this day in the early 2000’s, this method of constructing houses is still around. Although it may seem as if the kit house idea is a thing of the past, the reality is that every new house that is stick built in the traditional way in the 21st century is built as a kit house. An architect designs the house, develops construction documents, it gets bid to contractors, and the awarded contractor purchases all of the materials which are delivered to the project site on large trucks. In other words, the kit house didn’t go away, it became a common way of building made possible by the innovations in the construction and transportation industries. While researching this area of kit houses, I wondered if the kit house companies should have transitioned to a large store like Home Depot, Lowes, and others where customers would be able to see all of the designs and purchase a kit the same day in the late 1900s. Anyhow, one of the houses that combine the idea of attainable building materials and the streamlined transportation process to construct a house of the late 20th century is Charles and Ray Eames’ case study house. Both Charles and Ray Eames believed in using the latest manufacturing technologies to mass produce beautifully designed products for the general population. This means that the prices of their products would be attainable by anyone. However, we all know that in the 21st century, an Eames lounge chair goes for at least $5,000, which goes against their general beliefs and was likely not their decision to make. If we look at their case study house, the fascinating part of the design is that it used off the shelf components in all areas of the house. From the structure to the glazing panels down to the furniture and finishes, the entire house was made from materials that were readily available. Just like the original kit houses, the only things that had to be custom made was the foundation that the house would be constructed upon. Why am I so fascinated by the Eames case study house? The modern and beautiful design of this large house was made from off the shelf products. Altogether, the cost of the house was approximately $1.00 per square foot in 1949, which would be about $10.25 per square foot in 2018. I’m sure this number would fluctuate in today’s building industry with the change in materials prices and other factors. 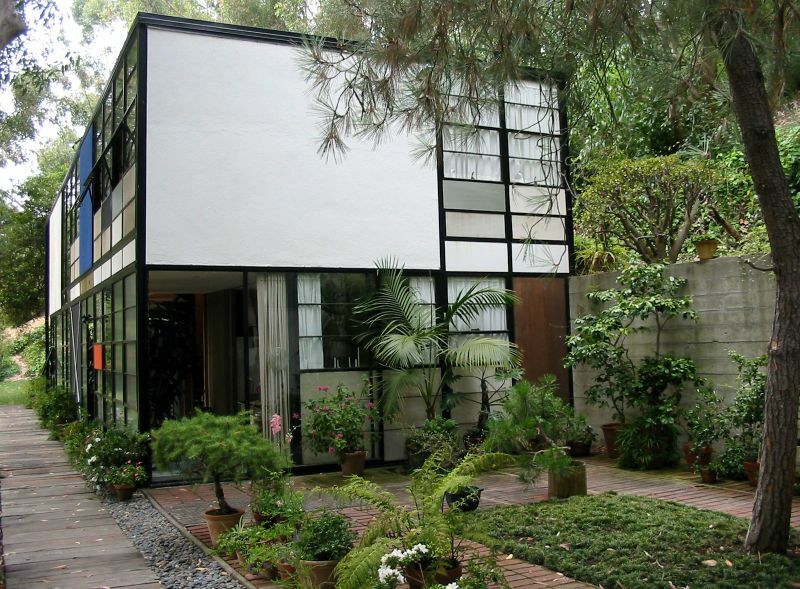 You can read more about the Eames’ case study house in this old New York Times article. You can learn more about the Eames house at the Eames Foundation. As I bridge the gap between the fall of the kit house and the rise of prefabricated housing, I’m learning so much about the relationships between the construction and transportation industries along with the innovative and readily available materials of our century. My next step is to research the rise of prefabricated homes in the 21st century and continue exploring the Eames’ case study house which has always been one of my favorite architecture projects. Stay tuned for more!